In basketball there are three places on the floor that are the most efficient: at the rim, behind the three point line, and at the free throw line. Those three spots have become the pillars of how GM Daryl Morey has built his roster. These are also the spots where the rosters star, James Harden, thrives. Harden, throughout his years in Houston, has maintained his ridiculous efficiency despite not putting up elite percentages from the field by getting to the line more than anyone. From the time he arrived in Houston to the end of last season, Harden has shot over 1000 more free throws then the next closest player, and has the highest proportion of free throw attempts to field goal attempts of any non-center. Due to his foul drawing ability he has been the only player in the NBA to have a 31% usage and 60% true shooting during that span, mixing efficiency with volume like no one else. After his second most efficient season as a Rocket (61.3% True Shooting), the league decided to clamp down on the tricks Harden had developed to get to the free throw line, implementing what are known as the "Harden Rules". These new rules, which changed what is considered a shooting foul and what isn't, have dashed Harden's free throw rate from .551 during his Rockets tenure, to just .438 - the lowest number since his rookie season. With the reduction in free throws, many thought Harden's efficiency would drop, but how did he respond? By putting up what is so far his most efficient season as a Rocket with a 62.6% TS and career high in usage. Harden's insane scoring in isolations have been a huge part of what has caused his overall efficiency to rise. 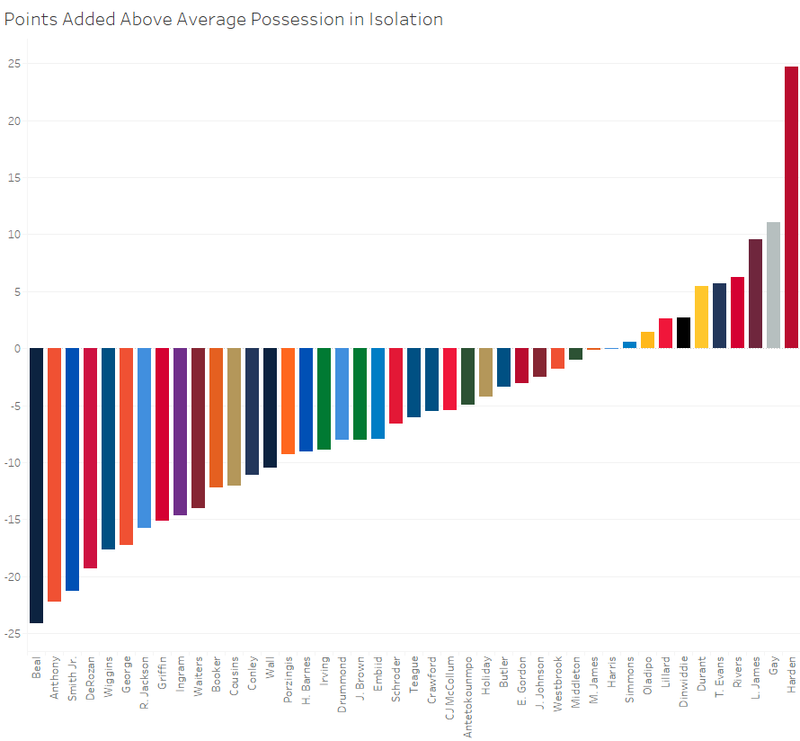 Isolations are typically an inefficient way for a team to score, the average isolation yields just .83 points per possession vs the average offense scoring 1.05. However, Harden has made it brutally effective. Harden leads the league in isolation possessions while also being more efficient than 93% of the league in those possessions (1.23 points per possession). So while a typical isolation possession is a negative play for every team, a Harden isolation is more effective than the leagues best offense of 1.16 points per possession. To help visualize this, here is how many points the top isolation players this season have added (or subtracted) over the league average offense by attempting to score in isolation. That mix of volume and efficiency in isolation is unheard of, and a huge part of the Rockets offensive success. You can defend all of Houston's actions perfectly just to have Harden break his man down and get a bucket. Perhaps the main culprit in Harden's increased efficiency away from the free throw line and in his isolation play has been his ability to shoot off the dribble, another typically inefficient play. Harden has been, without a doubt, the best pull up shooter in the league this season. Harden is shooting over 41% on eight and a half pull up three point shots a game. That's comparable to Stephen Curry's unanimous MVP season where he shot 43% on six and a half attempts a game. When prorating Steph's MVP season down to 20 games, Harden has added more points above the average pull up possession so far, once again mixing volume and efficiency at an unforeseen level. 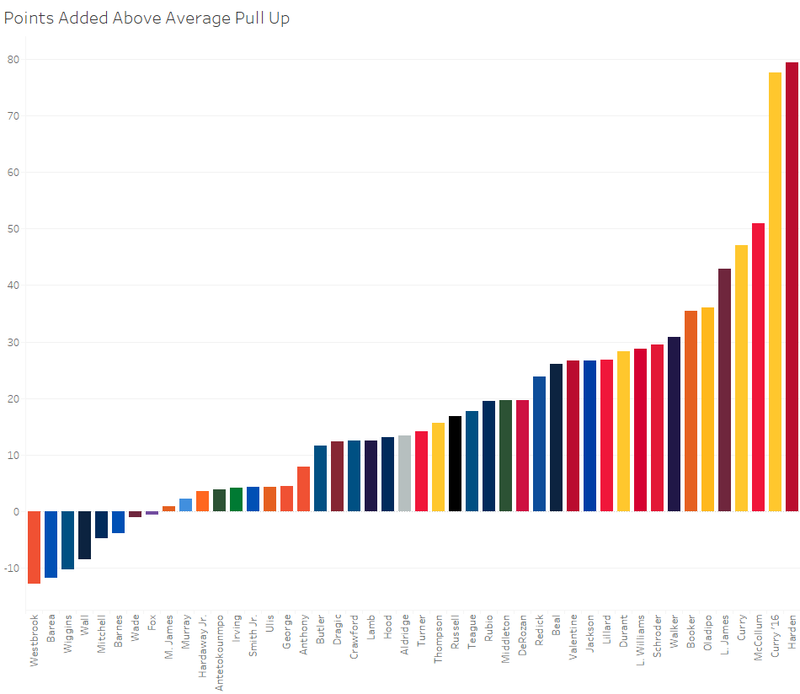 This visual shows just how massive the gap has been between Harden and every other player on pull up jump shots this season, along with his narrow victory over 2016 Steph. Harden has been a hard shot Taker (and maker) his entire career, but it appears that he has taken the latter part to a whole new level. It is yet to be seen if Harden is able to continue this efficiency on some of the toughest ways to score, but it's also yet to be seen if he will continue to see fewer trips to the free throw line. If the number of free throw attempts bounces back to career norms and Harden maintains this mind blowing efficiency on these play types, we will see an all time scoring season from the beard, and the Houston Rockets as a whole.